Let me introduce you to 1996’s Hollywood Rock of Fame and Cleveland’s Rock and Roll Hall of Fame saxophonist of Parliament Funkadelic, Greg Thomas. Greg is a musician whose talent is deeply rooted in Afro-American culture. Throughout the years he has learned how to perform all types of music from R&B to Hip-Hop, Acid Jazz to Blues to Gospel, Rock and Rock ‘n Roll, to Polkas. However, Jazz-Funk is where his true love lies. This talented musician began playing at the early age of five and his musical talents are diverse. 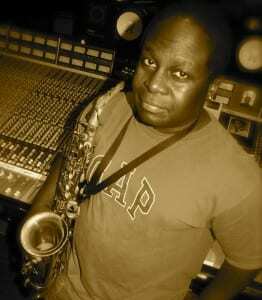 Greg has mastered the alto, soprano and tenor saxophones; clarinet; flute; oboe; bass guitar, piano and drums. He is also a producer, arranger, singer, songwriter, composer and conductor. Currently, Greg is performing and recording with George Clinton and the P-Funk All-Stars, whom he has been with for many years. He has also performed with great artists such as Bootsy Collins, Maceo Parker, Fred Wesley, Stanley Clarke, The Gap Band, Cameo, Snoop Dogg, Stephanie Mills, Mtume, The Spinners, Lou Rawls, Patra, Peter Wolf, Crystal Waters, Chuck Brown and The Soul Searchers, Evelyn King, Too Short, Ike Turner, Al Green, Howard Hewett, Glen Jones, Phil Perry, Raphael Saadiq, and various other artists. Greg performs extensively in the U.S. and Canada, as well as other countries such as Australia, Austria, Japan, Spain, Switzerland, Finland, France, Poland, Germany, England, and Holland. Greg’s television and video credits include the 2005 Jerry Lewis Muscular Dystrophy Telethon with George Clinton & the P-Funk, the BET 25th Anniversary Special, The Carson Daly Show, The Tonight Show with Jay Leno. In 2004, Greg performed at the Grammy Awards Show with George Clinton & the P-Funk; was featured in the national Nike 70s-style commercials along with George Clinton, Bootsy Collins and Snoop Dogg. He has performed on the night-time talkshows of Arsenio Hall and David Letterman, the Rock ‘n Roll Hall of Fame show (on HBO), and television’s ‘New York Undercover’ and ‘Soul Train;’ the music videos ‘Think’ (by the artist Patra) and ‘Getting It’ (by the artist Too Short), ‘P.C.U.’ (motion picture), as well as numerous George Clinton music videos. Most recently, Greg was filmed along with George for the DVD/CD release of George Clinton and Parliament Funkadelic, Live At Montreux 2004,’ where he was a featured performer.